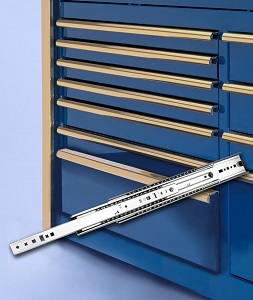 The 7900 slides offer full extension, a load rating up to 350 pounds, and accommodate drawers up to 42" wide. For added versatility, the slides may be flat mounted at a lower load capacity of up to 150 lbs. per pair. Designed for applications such as mobile toolboxes and utility vehicle storage, the 7900 slides are a good drop-in alternative for .75" side space projects, giving fabricators additional slide options for mid-range loads, while increasing the aesthetics of the finished product. Model 7950 does not offer a disconnect method, while Model 7957 has a handed lever disconnect. Both models have an enhanced ball retainer design, which mitigates retainer migration. These slides are available in lengths of 12" to 36" in a clear zinc finish.